When playing a team that runs a traditional cover 3 defense you need to find the holes in the coverage. As you can see by the illustration below there are several open windows in the defense. The goal with a flood is send more offensive players into an area than the defense can cover. In this play the 1st area we are targeting is with our Z receiver, he is going to run his wheel and look to slow down or settle in the area 8-12 yards down the field along the sideline. Our Y is running a skinny post just to the inside of the corner on his side dropping into the deep third. By running inside he will also grab the attention of the safety in the middle of the field. 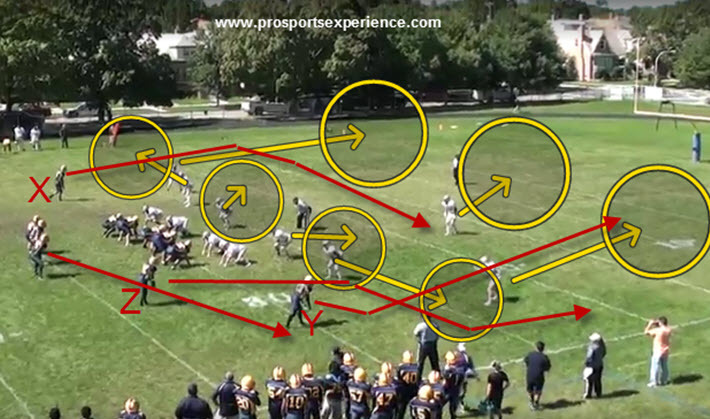 This will give the X running a dig route a window 10-12 yards down the middle of the field. Our Running back is running a route to occupy the line backer covering the flats.